The Kindermusik Foundations class provides a delightful environment unlike any other. Through a unique blend of multi-level activities that include creative movement, vocal play, object and instrument exploration, and a colorful literature component, baby’s growth and development are stimulated and all senses engaged. Kindermusik Foundations is for lap babies, crawlers, and walkers. 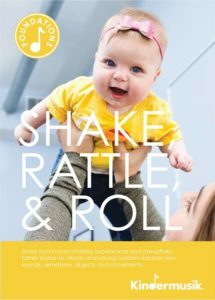 It incorporates the most current research on early childhood development and provides families a special place for learning and connecting with other parents and babies through music and movement. Class Structure: 32 classes with new themes every 4 weeks. Variety of Music — Musical diversity builds strong neural connections in a baby’s forming mind, which is why each Kindermusik semester contains an array of styles, sounds, and genres. Instrument Play — Age-appropriate experiences with child-safe instruments enhance a sense of rhythm and steady beat, develops a keen awareness of the distinguishing qualities of sound, and encourages spontaneity and creativity. Dance — A classroom full of baby and adult pairs dancing together helps a little body develop the muscle strength needed to crawl and walk and helps a little heart to fall in love with the sheer joy of responding to music. Together Time — A Kindermusik class is truly the essence of “quality time,” offering the parent a place to create special memories with their child, gain new insights into their child’s development, and nurture their child’s natural love of music. Expert Advice — A Kindermusik Educator explains “what-to-watch-for” every step of the way and how each activity enhances a child’s complete development. Learning Continues at Home — With the home materials, the learning continues at home with the child’s best teacher—the parent! Digital Home Materials—one for every 4 lessons. Learn over 30 songs, lullabies, and nursery rhymes and play over 200 activities together by the semester’s end. Is this class right for your child? For additional information on tuition fees, terms and scheduling, please contact us at 315-737-7498.